Health & Fitness Is coconut oil a poison or a cure? Is coconut oil a poison or a cure? Coconut oil has been touted to treat all sorts of ills including viral infections, eczema, psoriasis, heartburn, inflammation, diabetes, obesity, even Alzheimer’s disease. That’s currently the case for coconut oil, a dietary fat that in recent years has been touted to treat all sorts of ills including viral infections, eczema, psoriasis, heartburn, inflammation, diabetes, obesity, even Alzheimer’s disease. Earlier this summer, though, an epidemiologist and professor from the Harvard T.H. Chan School of Public Health called coconut oil “pure poison” and “one of the worst foods you can eat” during a lecture given in Germany. Very bold – and fear-mongering – statements to make, I’d say, particularly when there’s no evidence to back them up. Scientifically speaking, fatty acids (the building blocks of dietary fats) differ by the number of carbon atoms they contain. Long-chain fatty acids have 12 to 20 carbons, whereas medium-chain fatty acids are composed of six to 10 carbons. Coconut oil contains a higher proportion of medium-chain fatty acids (also called medium-chain triglycerides or MCTs) than other vegetable oils, which are made up mostly of long-chain fatty acids. Owing to their shorter chain length, MCTs are believed to have unique health properties. Coconut oil benefits: Hype or real? 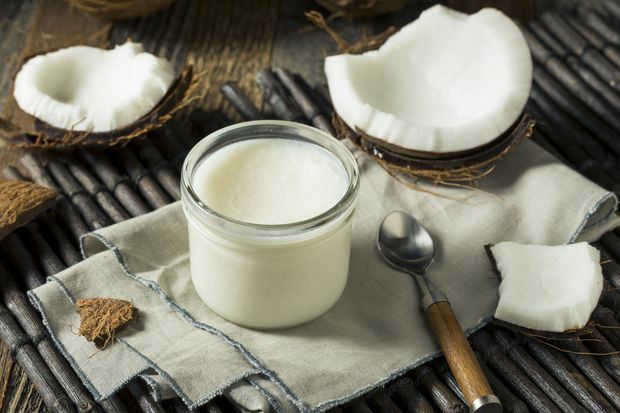 Compared with long-chain fatty acids, MCTs are thought to be more quickly metabolized, stored to a lesser degree in body fat and increase fat-burning, which is why coconut oil is often promoted for weight loss. A review of 13 trials, published in 2015, did conclude that replacing long-chain fatty acids with MCTs in a weight loss -diet could potentially help dieters lose a little more weight and body fat. Keep in mind, though, that these studies gave participants an oil that was made up entirely of medium-chain fatty acids. Only 13 per cent of the fat in coconut oil comes from MCTs. Studies using smaller doses of MCTs have not been shown to increase calorie-burning or fat loss. Two very small studies that investigated coconut oil for weight loss turned up mixed results. Not much to go on. Compared with other oils, coconut oil contains a hefty amount of lauric acid, a saturated fat that has been shown to increase HDL (good) blood cholesterol and have antibacterial properties. Despite all the hype over coconut oil, there’s scant evidence to support its many health claims. But is coconut oil a poison? It’s coconut oil’s high saturated fat content (83 per cent) that many health organizations, including the Heart and Stroke Foundation of Canada and the American Heart Association, take issue with. Saturated fat is found in animal foods such as meats, butter and cheese as well as some plant-based oils, including palm oil and cocoa butter. Since high saturated fat diets raise LDL (bad) blood cholesterol, a risk factor for heart disease, we’re advised to limit sources of it in our diet. Last year, the American Heart Association published a comprehensive review of scientific evidence, which concluded that replacing saturated fats with polyunsaturated fats (e.g., sunflower oil, safflower oil, pumpkin seeds, oily fish) reduced the risk of cardiovascular disease by roughly 30 per cent. Eating less saturated fat and more monounsaturated fat (e.g., olive oil, canola oil, avocado, almonds) was also deemed protective of heart disease and stroke. The organization also reported that coconut oil raised LDL cholesterol in seven controlled trials and, therefore, recommended against its use. Even so, coconut oil is not a poison. Nor is butter, which also contains a lot of saturated fat (63 per cent) and raises LDL cholesterol to a greater degree than coconut oil. But saturated fat isn’t the whole story when it comes to preventing cardiovascular disease. The overall quality of your diet matters the most. Include fruits and vegetables, whole grains, beans and lentils and nuts in your regular diet. Eat fish and poultry more often than red meat. Limit refined starches and added sugars. So, go ahead and use a little coconut oil if you like. But don’t use it at the exclusion of heart-healthy unsaturated fats and oils.